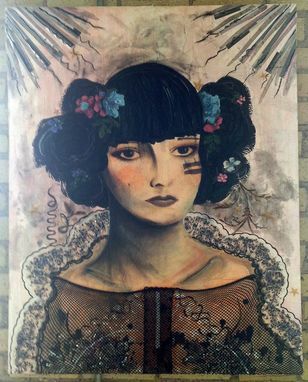 This artwork, The Warrior, uses a multitude of materials including acrylic paints, antique lace, crushed glass, papers, fishnet stockings etc. It was an adaption of a work by another artist. If you like the style of this work I could create similar pieces incorporating people's portraits and certain mixed media materials significant to you. The finished size is 30" by 40".